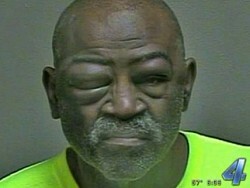 Police in Oklahoma highway police are facing questions this week after beating an elderly deaf Oklahoma man, Pearl Pearson, 64, after he allegedly refused to comply with their orders during a routine traffic stop. Police say that Pearson left the scene of a minor automobile accident and was pulled over on January 3rd. They say that they verbally ordered Pearson from their cruiser to show his hands and did not do so. Pearson had a large sign on his driver’s door stating, “Driver is deaf.” However, he says that the police ran up to the car and started hitting him in the face as he tried to show them an identification card explaining that he is deaf. He was arrested for resisting arrest and leaving the scene of an accident. He says that he was then denied a sign interpreter which he was in jail and has never been given such an interpreter to speak with police at the hospital or at the jail. What is also interesting is that Pearl’s son is a police officer as is his son-in-law — a fact that his family say that he is unlikely to ever resist police. While I can understand the arrest for leaving the scene, there are obviously a host of questions as to how the police handled this pull over stop on the highway. I am equally concerned with the alleged absence of an interpreter in such a case when police have beaten a man to the point of requiring hospital treatment. I am not sure how the hospital was able to address those injuries without such an interpreter. News reports also state that the police affidavit made no mention whether or not the troopers realized Pearson was deaf. That would seem a pretty relevant issue for a police report. As I usually say I would like to see the report / dashcam but in this case it is very difficult to imagine this as being justified by the OHP. A capable officer is trained to assume someone might be deaf with regard to not responding to commands. There are multiple scenarios in training where deaf individuals (or actors portraying this) are used. Mr. Turley, with all due respect, you speak so softly about matters so brutal. Being deaf is now a crime. One can ponder, how many more of these similar incidents will happen before the police departments completely lose the confidence of the tax payer? Every week no less than a dozen stories like this can been read. In a very general sense, it is very odd how such highly trained cops have the ability and skill to read a 1 inch square number of a windshield sticker that is out of date from a mile away at a closure speed of 140 mph (sarcasm), but can’t tell a toy gun at 20 ft from a real one before emptying a pistol magazine, firing and killing a child…and then justify their action saying they were just following procedures and practices. And then after all that, still have the absolute gall to believe they are doing their public duty by risking their lives to benefit you, while demanding your respect and cooperation in their investigations and to support this same system while serving on juries. One has to ask…really? I am so disappointed. We get what we pay for in this country. The calibre of police officers is repeatedly shown to be far below what an advanced society should have. If you travel to most other countries in the Western World, like Canada, you do find from time to time that some moron has slipped through the cracks but on general, the intelligence level of a police officer is, by demand, much higher. In Victoria, British Columbia, a police officer must have a degree in criminal justice to be considered. Even with that the applicant must exhibit an attachment to the justice system that had occupied his or her time for at least a few years prior to being considered. I have travelled throughout Europe, have dual citizenship with Canada, and the type of person that, perhaps has found his or her self a police officer by default, seems to exist mainly in this country. A day doesn’t go by without some story similar to this. Police officers act irrationally because they are in fear of their lives in this ‘gun toting’ country, however, far too many are simply disadvantaged when it comes to using common sense. Hear no kop evil, see no kop evil, and speak no kop evil. The kop can do no wrong. Unfortunately, this kind of incident involving hearing impaired people is not a first, and no doubt will not be the last. Recall this story from back in 2011 when Seattle police shot and killed a deaf man. A woodcarver who did not drop his carvng knife when ordered. These officers and their supervisors need to be answering some serious questions in front of a judge! Shouldn’t these officers be behind bars awaiting arraignment on battery charges?? Reading a sign takes time, and taking that time would endanger the officer’s life. An officer’s safety and that of his partner is his first responsibility, so not taking the time to read the sign, but instead beating the crap out of the guy for non-conpliance was the correct thing for the officer to do. We cannot have citizens walking around with signs about how police should treat them, and expecting police to endanger their own lives by taking the time to read those signs before making an arrest. Yes, I am being farcial, but I have more than once heard an offer say that his own safety is his first responsibility, causing me to want to be sure I never come anywhere near him at any time. This is terrible….. Mike A…. Maybe you can get the case and go pro hoc vice…… It just sounds like it’s going to be a good CYA…. All the way…. Very bad. I bet his son has had a “chat” w/ these cops. Another example of trickle-down torture, IMO. A lot of angry folks out there, including cops. With stories of unwarranted police brutality appearing on at least a weekly basis, many of them making it to Professor Turley’s blog, one wonders if state, county, and municipal police forces set aside “stupidity funds” in their budgets in expectation of future lawsuit settlements over these sorts of episodes rather than do what would seem to be the easier course of action – weeding out the bad seeds. It’s an analogous mentality to that which caused Ford Motor Company in the 1970s to do a financial analysis of correcting exploding gas tanks in Pintos vs. the cost of lawsuits and settlements as a result of not fixing the defective tanks and opting for the latter. The obvious difference is that Ford’s actions involved only its own money. The police entities use taxpayer money to cover their bungling behavior. Suddenly, I am ashamed of living in Oklahoma. The cops are fortunate that some relative does not shoot and kill them when they are taking out the garbage this morning. He is fortunate they did not shoot and kill him. A beating by police is getting off easy these days. Maybe they should teach their officers to read?